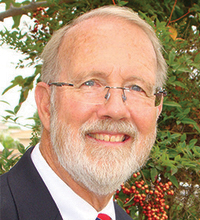 Christopher Lenocker (’78) has served the church since 1978 throughout congregations in California—San Juan Capistrano, Fox Chapel, Long Beach, and now San Diego. Most of his ministry has taken place in merged churches in Long Beach (1987) and San Diego (1995 to present). He has had the privilege of serving on the Presbyteries Cooperative Committee on Examinations for Candidates (PCCEC) as chair of the Biblical Exegesis Task Group and chair of the committee for two years. He has been involved at the presbytery level with students preparing for ministry, on CPM, and preparing students for exams and proctoring exams. His heart was changed by a sabbatical in Kenya where he was able to work with a local pastor in the Jubé parish near the Rift Valley. He returned two years later with some people from his church to build a sanctuary in partnership with the Out Reach Foundation.